Studies suggest that a diet rich in Pistachios (and other nuts) can actually improve erectile function. It is known that ED and heart disease can be two different manifestations of an underlying condition, poorly functioning or diseased arteries. To help combat clogged blood vessels one should seek a diet full of anti-inflammatory and antioxidant foods, those that could help lower cholesterol levels. A handful of nuts each day have been shown to improve chronic erectile dysfunction in just three weeks, pistachio nuts that is. Erectile dysfunction is often related to poor heart health because the same processes needed to maintain an erection – blood vessel relaxation – becomes impaired. Nuts such as almonds, walnuts and pistachios have been show in a number of studies to improve heart health so it makes sense they may help men suffering from erectile dysfunction as well. To see if a small amount of pistachio nuts (100 g) each day could improve erectile dysfunction 17 married men who had experienced erectile dysfunction for over a year added pistachios to their diet. The study* concluded that after three weeks the men had marked improvements in erectile function and the only ‘side effect’ was improved cardiovascular health. This should not be surprising. Antioxidant-rich foods can boost nitric oxide production. 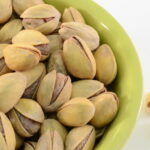 Pistachios have a bunch of both antioxidants and arginine, which may help explain the improvement in blood flow. We also know that cholesterol is an important predictor of sexual dysfunction in both men and women and after just three weeks, those eating pistachios had significant improvements in cholesterol. *Source: Pistachio diet improves erectile function parameters and serum lipid profiles in patients with erectile dysfunction.